2 weeks - Optics "Ochi"
Modern manufacturers offer contact lenses with a daily, two-week, quarterly and long period of wearing (6-12 months). The most popular were two-week contact lenses . Why do patients choose products of this type? Clarity and clarity of vision throughout the use of contactor correctors. Perfect fit on the cornea, which makes it easy to put a pair on even a beginner. Comfort. Short term validators do not allow the accumulation of surface protein and lipid deposits, so they do not require enzymatic purification by special means. There is no need to spend time on special procedures, both for long-wearing products. The special fineness of the product, the perfect smoothness of the surface and the unique properties of the material used, ensure the biocompatibility of the contact lens and the cornea of ​​the eye, allowing you to quickly "get used" To a foreign object. No sensation of dryness and redness of the eyes with prolonged day or prolonged wearing (14/6 days). Humidification is provided by a high moisture content in contact corrective vision products. Also, unique features of the products were noted in the case of dry eye syndrome and a predisposition to allergic reactions. Even with a round-the-clock wearing, no unpleasant symptoms were manifested. Studies carried out by ophthalmologists fully confirm the patient's claims. It has been established that contact lenses for 2 weeks are the safest, since during this period the amount of natural biological deposits is so minimal that they do not cause irritation of the eyeball and allergic manifestations, and the lens structure protects the cornea from infection. 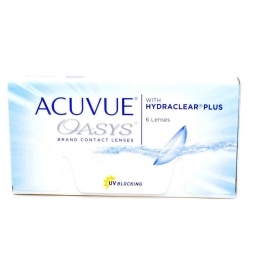 Comfortable wearing of this kind of vision correctors is promoted by high oxygen permeability and sufficient moisture during the entire period of wearing. After the specified period of operation, contact lenses lose their properties and can not provide clarity and visual acuity at the proper level, therefore it is necessary to abandon further use of the pair. High-quality original lenses for 2 weeks to buy can be found in the online store optics Oki .